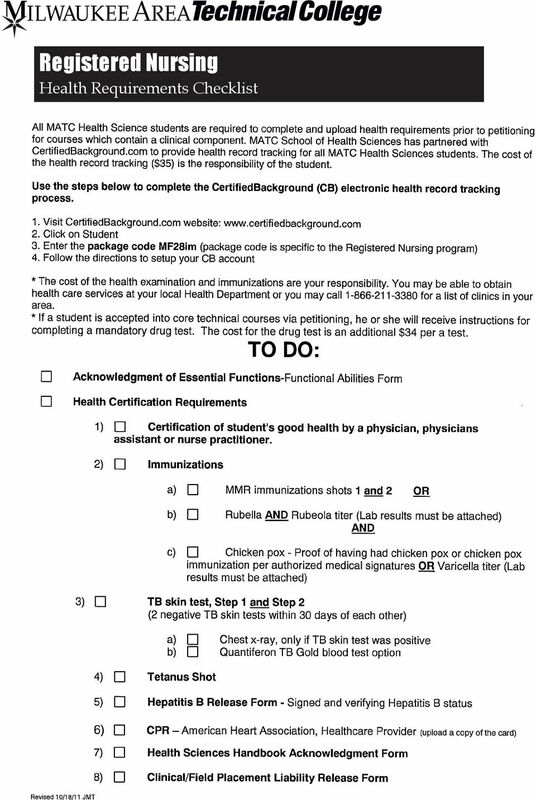 Download "Registered Nursing Health Requirements Checklist"
13 The applicant must: 1). 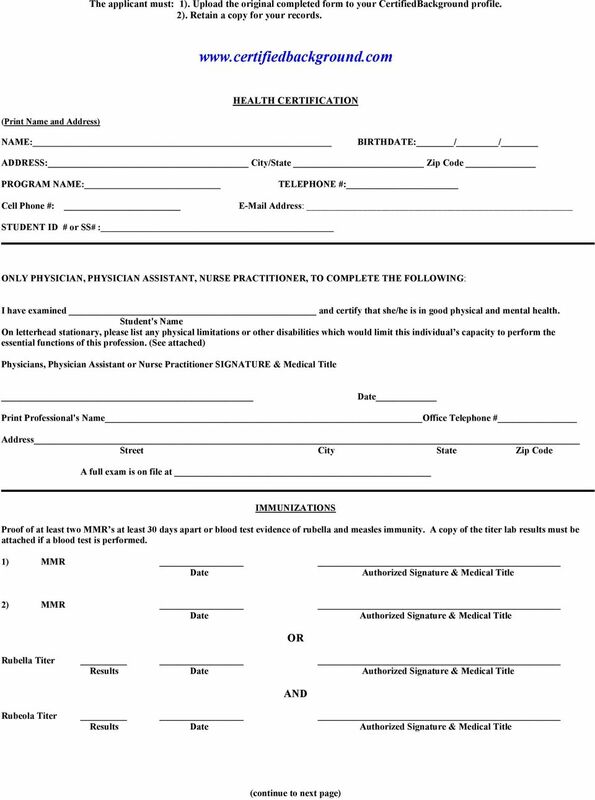 Upload the original completed form to your CertifiedBackground profile. 2). Retain a copy for your records. 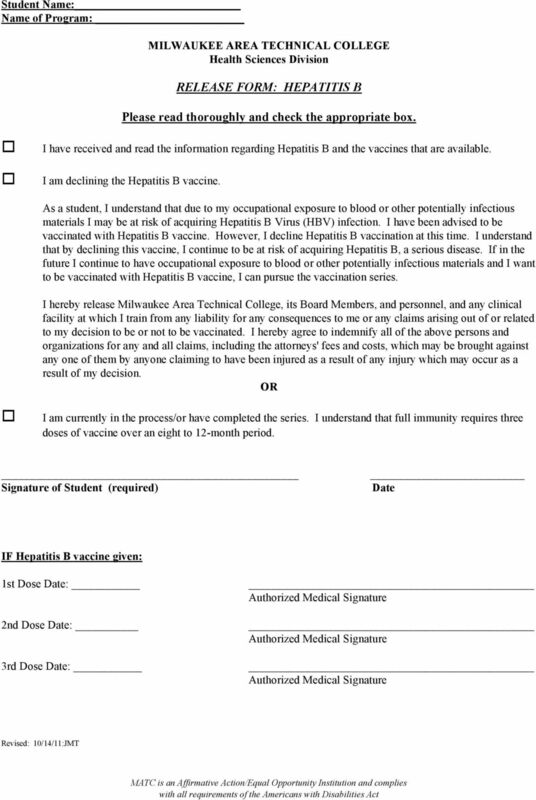 PROOF OF TETANUS IMMUNIZATION: (Within the last 10 years) Date Authorized Signature and Medical Title PLEASE NOTE: You MUST make a copy of your completed health form and retain it. You may need to provide it to a clinical agency. IMPORTANT DO NOT UPLOAD UNLESS ALL RESULTS AND SIGNATURES ARE COMPLETE. 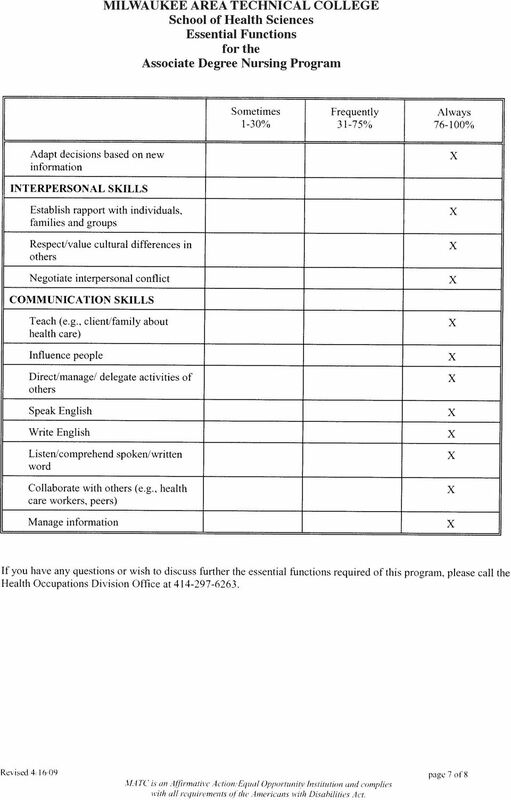 I give permission to release information on this health form to the professional college and clinical affiliate staff if it is deemed necessary benefit and/or safety of myself and others. 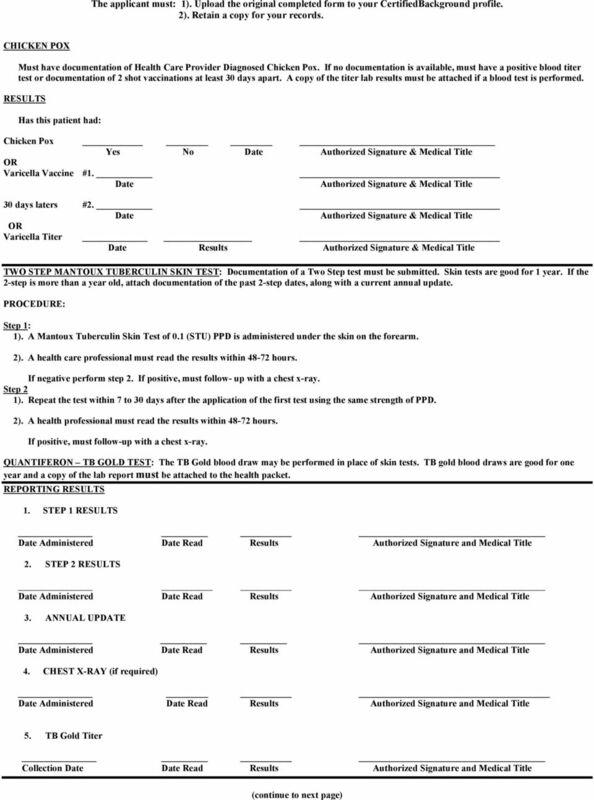 Signature of Student INSTRUCTIONS TO STUDENTS Did your doctor or authorized medical person sign every authorized signature, dates and results of tests? 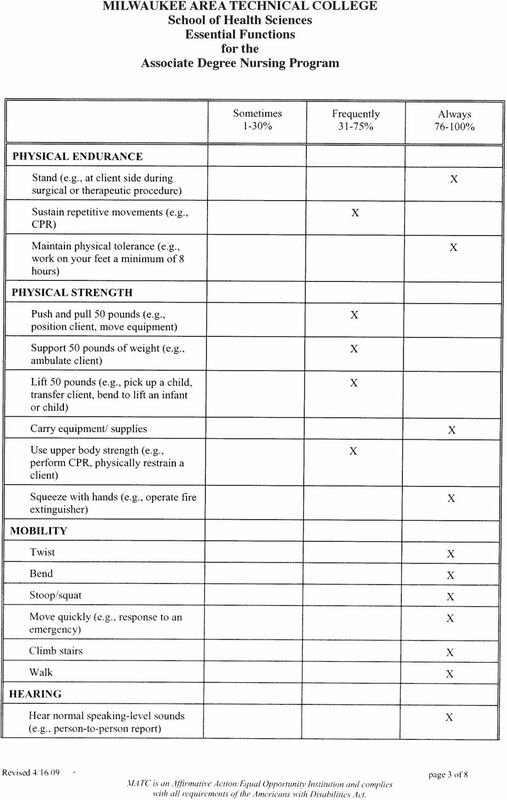 Is your physical exam completed and all necessary information on the form complete? i.e. 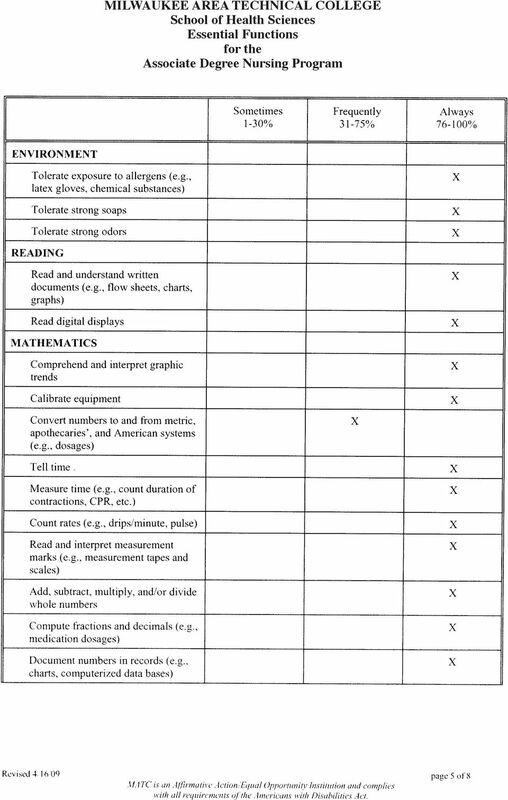 (signatures, print name, address, telephone #, lab results, etc.) Do we have your home phone # on the space provided? Do you have a copy? 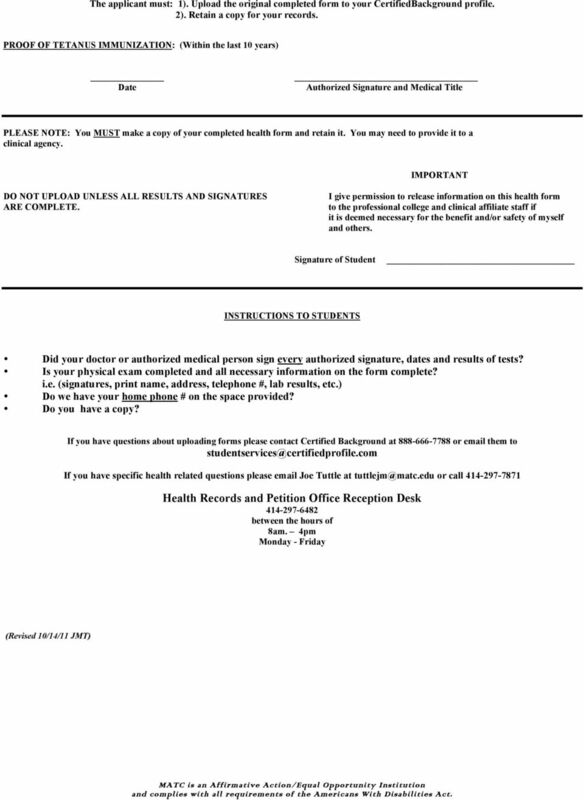 If you have questions about uploading forms please contact Certified Background at or them to If you have specific health related questions please Joe Tuttle at or call Health Records and Petition Office Reception Desk between the hours of 8am. 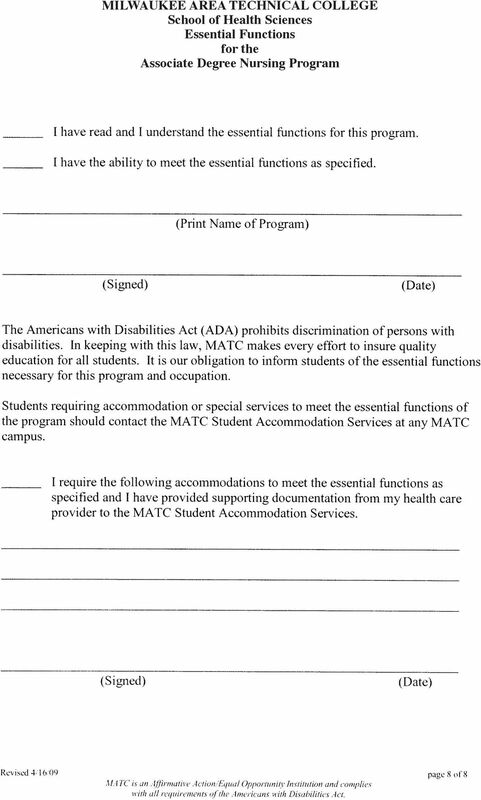 4pm Monday - Friday (Revised 10/14/11 JMT) MATC is an Affirmative Action/Equal Opportunity Institution and complies with all requirements of the Americans With Disabilities Act. 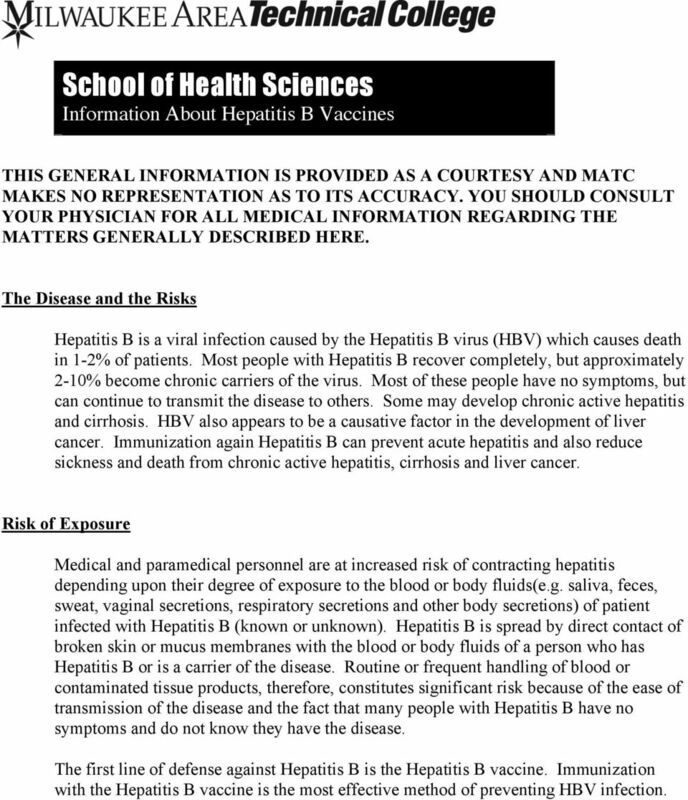 14 Information About Hepatitis B Vaccines THIS GENERAL INFORMATION IS PROVIDED AS A COURTESY AND MATC MAKES NO REPRESENTATION AS TO ITS ACCURACY. YOU SHOULD CONSULT YOUR PHYSICIAN FOR ALL MEDICAL INFORMATION REGARDING THE MATTERS GENERALLY DESCRIBED HERE. The Disease and the Risks Hepatitis B is a viral infection caused by the Hepatitis B virus (HBV) which causes death in 1-2% of patients. Most people with Hepatitis B recover completely, but approximately 2-10% become chronic carriers of the virus. Most of these people have no symptoms, but can continue to transmit the disease to others. Some may develop chronic active hepatitis and cirrhosis. HBV also appears to be a causative factor in the development of liver cancer. Immunization again Hepatitis B can prevent acute hepatitis and also reduce sickness and death from chronic active hepatitis, cirrhosis and liver cancer. Risk of Exposure Medical and paramedical personnel are at increased risk of contracting hepatitis depending upon their degree of exposure to the blood or body fluids(e.g. saliva, feces, sweat, vaginal secretions, respiratory secretions and other body secretions) of patient infected with Hepatitis B (known or unknown). Hepatitis B is spread by direct contact of broken skin or mucus membranes with the blood or body fluids of a person who has Hepatitis B or is a carrier of the disease. Routine or frequent handling of blood or contaminated tissue products, therefore, constitutes significant risk because of the ease of transmission of the disease and the fact that many people with Hepatitis B have no symptoms and do not know they have the disease. The first line of defense against Hepatitis B is the Hepatitis B vaccine. Immunization with the Hepatitis B vaccine is the most effective method of preventing HBV infection. 15 The Vaccine The Hepatitis B vaccine (Engerix B, Recombivax HB) is produced using recombinant DNA technology. The vaccine works by stimulating the immune system to produce antibodies to the virus. The vaccine is given intramuscularly in the deltoid in three doses. The second dose one month after the first, and the third dose six- twelve months after the second. After vaccination, more than 90% of healthy adults develop protective antibodies. The cost is about $ series. Only minor adverse reactions have been reported with vaccination, including transient fever and soreness at the injection site, rash, nausea joint pain and mild fatigue have also been reported. The vaccine is not contraindicated in pregnancy. 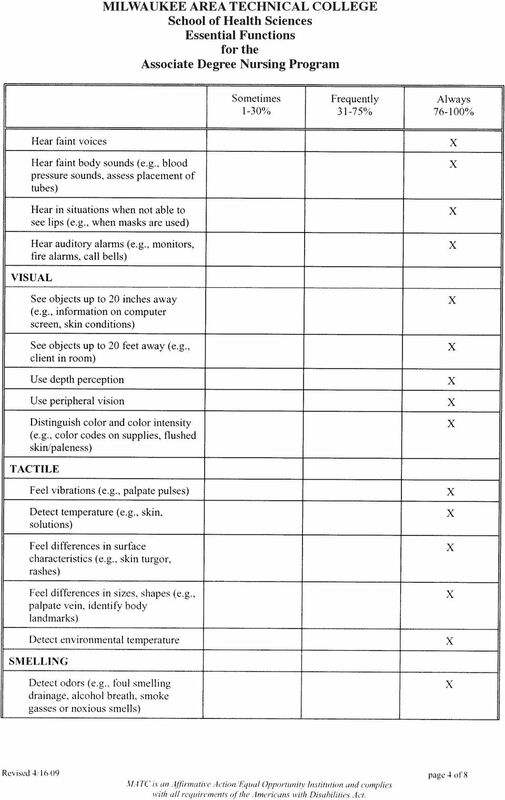 Reference a. Ganza, a., Torshner, L. (1997) Hepatitis Update. RN, 60 (12), b. 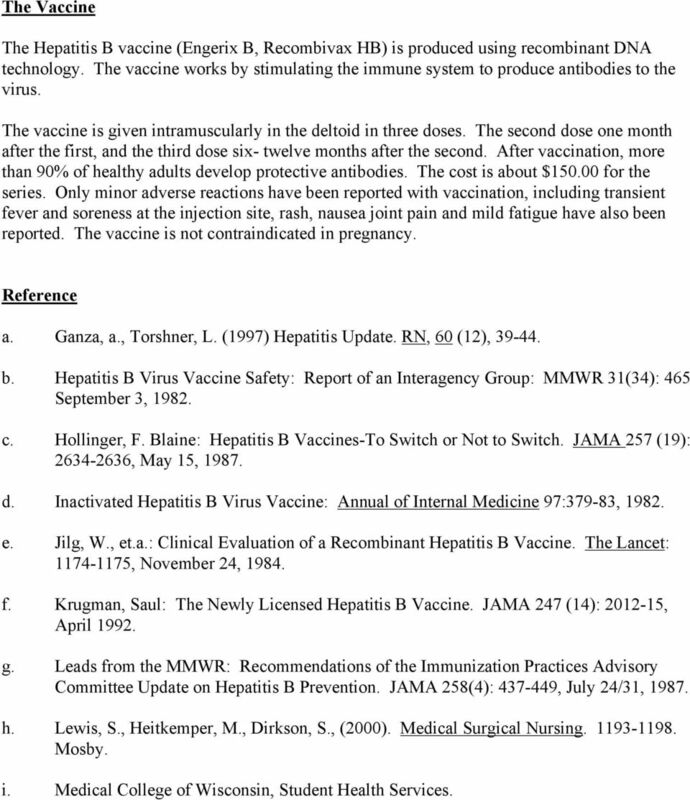 Hepatitis B Virus Vaccine Safety: Report of an Interagency Group: MMWR 31(34): 465 September 3, c. Hollinger, F. Blaine: Hepatitis B Vaccines-To Switch or Not to Switch. JAMA 257 (19): , May 15, d. Inactivated Hepatitis B Virus Vaccine: Annual of Internal Medicine 97:379-83, e. Jilg, W., et.a. : Clinical Evaluation of a Recombinant Hepatitis B Vaccine. The Lancet: , November 24, f. Krugman, Saul: The Newly Licensed Hepatitis B Vaccine. JAMA 247 (14): , April g. Leads from the MMWR: Recommendations of the Immunization Practices Advisory Committee Update on Hepatitis B Prevention. JAMA 258(4): , July 24/31, h. Lewis, S., Heitkemper, M., Dirkson, S., (2000). 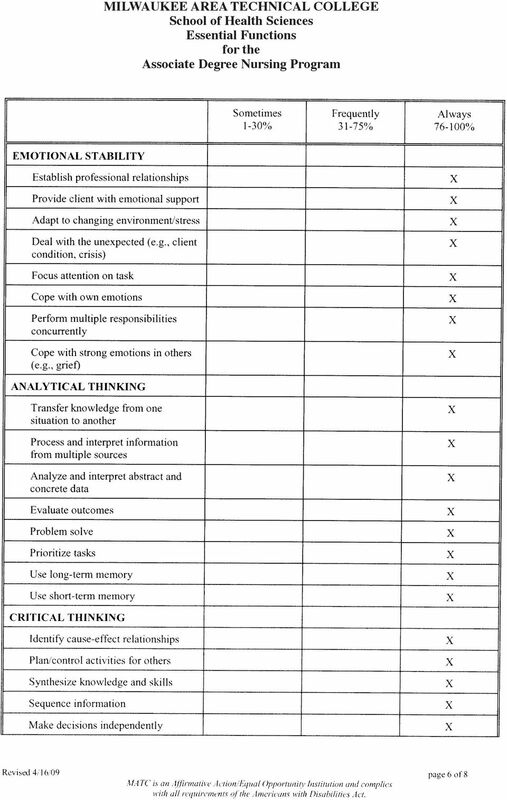 Medical Surgical Nursing Mosby. i. Medical College of Wisconsin, Student Health Services. Cost: 5 credit hours @ $148.64 = 743.20. 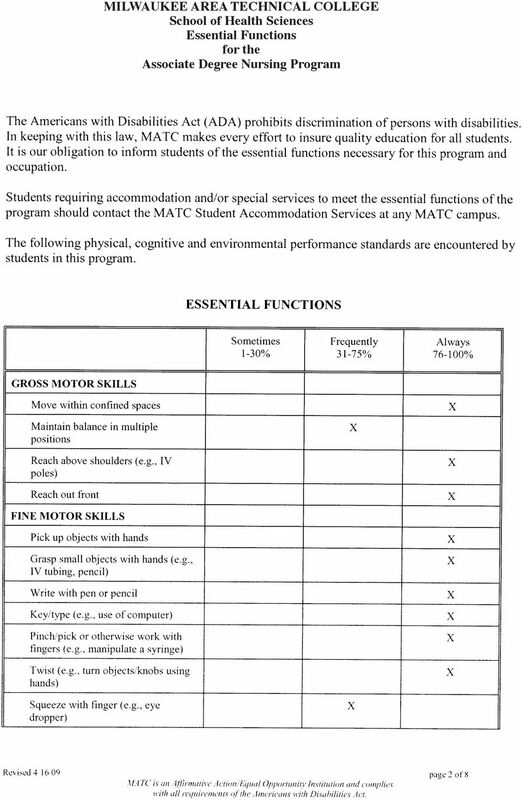 $100 for the State test. Other fees for admission ($15), facility fee ($45), registration fee ($9), lab and technology fee (37.50). Total $106.50 for other fees..
Total s KENTUCKY CORRECTIONS Policies and Procedures Date Filed 5 Authority/References P & P ACA Standard 3A-03 ACA 2-CO-1C-19 Subject * EMPLOYEE HEALTH ISSUES I. DEFINITIONS "Employee emergency healthcare"